The full golf swing refers to the long game, the driver and fairway clubs including fairway woods, long irons and hybrids. All these clubs incorporate a full swing which is where learning to play golf starts. The short game is important as well, but logically follows learning to properly hit the driver and fairway clubs. The old saying, “drive for show and putt for dough” applies here. The full golf swing is the "show" part of the game, and includes how it looks as well as the results. Achieving a good show can be frustrating for the weekend golfer. The trial and error process of getting a grooved golf swing can be hard work. It usually includes many practice sessions at the driving range followed by rounds of golf to measure progress towards achieving a more consistent golf swing. (1) Learning the game can be frustrating. Watching pro golfers play the game, especially on the PGA and LPGA tours, can be great fun. It’s what often encourages a weekend golfer to learn the game. They make it look so easy. Their full swings are a thing of beauty. But clearly this is a different game of golf than what week end golfers play. The pros have been coached for years and have practiced their golf swing almost daily to achieve the game they play to make their living. They hit hundreds of shots when they practice and they practice often when on the tour. This practice and dedication virtually hard wires their full golf swing into their DNA so that it perfectly fits their physique and natural abilities. A Pro golf swing looks so effortless, rarely looking like they are swinging hard. Making it look so easy is what inspires many new golfers to start playing. They are walking, swinging advertisements for the game of golf and account for it's growing popularity around the world. They inspire week end golfers to work on improving their game. Can a weekend golfer improve his or her game? Absolutely, and with some practice bogy golf or better is entirely possible. Bogey golf is good golf, fun golf, as explained here. But it takes practice to achieve a full golf swing groove. Dedicated week end golfers shooting bogey golf or better experience a great deal of satisfaction from playing the game. With a grooved golf swing comes the ability to make more frequent contact with the golf club “sweet spot” at just the right time in the down swing. This produces more distance and accuracy without swinging hard. The golf club sweet spot is that physical location on the club face which transfers maximum energy to the golf ball when forcefully coming into contact with the golf ball. The driver typically has the biggest sweet spot of any full swing golf club in the bag and it’s actually pretty small … about the size of a dime. But modern drivers are designed to maximize the sweet spot zone, an oval set of concentric rings around the smaller, circular sweet spot. While contact with the driver sweet spot is most desirable, frequent contact within the sweet spot zone reduces the shot effectiveness only slightly. The effectiveness of a golf shot falls off dramatically when ball contact occurs out side of the zone. I don’t want to get into the physics of golf club design here. Suffice it to say that impact within the sweet spot zone gives the weekend golfer a chance of making a fairly decent shot. Missing the sweet spot zone is the number one full golf swing mistake weekend golfers suffer. So what’s the number one cause for missing the sweet spot zone at impact? Swinging too hard and the irregular body movements incurred in the process. Not sure why so many week end golfers swing like maniacs including winding up, lunging forward, raising their heels off the ground. Maybe it’s the Happy Gilmore effect. Studies show that of all the reasons for playing golf the joy of just hitting the golf ball ranks highest. But somehow hitting the golf ball well and consistently often gets lost in the physical translation of the full golf swing for many weekend golfers. The resulting strike of the golf ball outside of the sweet spot zone leads to much less distance and accuracy, often resulting in a very poor golf shot. As golf ball contact moves out to the toe of the driver there will be increased distance and accuracy loss often resulting in a shot that will bend to the left side of the fairway (a hook for a right handed golfer). Similarly as the strike moves in towards the heel of the driver there's an even more severe loss of distance and direction and the shot will likely bend to the right side of the fairway (a slice for a right handed golfer). So the message for weekend golfers is avoid the Happy Gilmore effect in your full golf swing. Concentrate on keeping your golf swing timing and rhythm as smooth as possible. Maximum distance and accuracy will result from improved frequency of striking the sweet spot zone. Learning how to practice this swing is where the process of developing consistency starts. Just going to the driving range and swinging as hard as you can with no purpose or plan is really a waist of time. Becoming a more consistent golfer poses different challenges depending on the current level of your golf game. 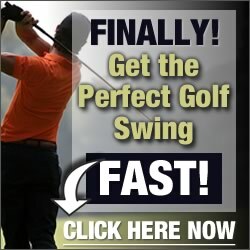 If you are a beginner still trying to break 100 you are likely searching for a full golf swing concept that will work for you. If you’re already shooting in the 80s on a regular basis you have a pretty good concept of your golf swing and are just looking to increase the consistency of your full swing groove. There are many ways for beginners to find their golf swing concept, but the best one in my opinion is to find a mentor who is physically about your size. Finding your golf swing concept is often a matter of mimicking a golf swing you like. This works best when you and this person are about the same size. He or she, of course, need to already have a grooved swing. Hopefully it’s a friend or relative who is willing to help you improve your golf swing. Maybe it’s someone you see at the driving range all the time, and you just love their swing and the way they hit the golf ball. Just having the opportunity to observe their swing will help you gain a concept of the full golf swing that is going to work for you. It’s kind of like having a real time video, and who knows you might even become friends and they might be willing to give you some pointers, sharing what has worked for them in developing their golf swing. There’s always the option of getting some lessons from your local Pro, but this can be pricey and you can’t go back and review a lesson like you can with a video. This brings me to the best option for both categories of golfers discussed here. Today’s digital revolution has simplified golf swing improvement training tremendously. Video instruction is the next best thing to getting lessons from the local Pro, and in many ways is better. You can go back and review the video training as often as you need to, and these video training packages will often include both audio and written instruction to further simplify the review process. Video review can easily become a routine before going to the driving range. Full swing practice with a plan is a much more effective way of improving a golf swing. For golfers already shooting in the 80’s looking to improve their golf swing accuracy and length it almost totally comes down to increasing the frequency of full swing sweet spot contact with the ball. I recommend you consider a practice drill Ben Hogan used for most of his career, especially after he recovered from a terrible automobile accident in the middle of his career. He called it “slow motion training”. He would often work on this drill when trying to correct a bad habit that would occasionally creep into his golf swing. But I'm going to suggest a practical twist to Ben's drill. Rather than using regular golf balls get yourself a couple of bags of golf wiffle balls from Amazon . Then you can perform this golf swing drill at home or anywhere you have access to a level grassy area. It’s best to do this with a fairway wood, long iron or hybrid. Set up as you normally would for this golf shot and proceed to execute your golf swing only do it in SLOW MOTION. Execute your normal golf swing mechanics exactly like you would at full speed only slow it way down. Concentrate on every part of your full golf swing … the set up, the back swing, the down swing, ball contact (a golf wiffle ball), and follow through. Do this a dozen times in very slow motion and then do another dozen only increase your swing speed just a little bit. Your still in slow motion, just a little faster than the first set of practice swings while concentrating on the smooth rhythm of your golf swing. Incrementally continue this process until you are swinging at full speed. Four or five slow motion sets incrementally faster until you reach your regular swing speed works best. The more controlled, incremental increases in swing speed the better. In this manner you will be committing your golf swing mechanics to muscle memory. You will feel some fatigue setting in after doing three to four reps so take a breather. Don’t rush through this drill. Rest a bit and finish with a dozen full speed golf swings using the wiffle ball. Observe the wiffle ball trajectory. It will give you some feedback on how frequently you are striking the sweet spot properly. Make small adjustments in your swing mechanics as necessary. Try to focus on one adjustment at a time. Like George W. Bush used to say ... it's hard work. But it will help you keep your golf swing mechanics tuned up (grooved) and over time help you become a more consistent golfer. You can even do slow motion training at the driving range hitting range balls instead of golf wiffle balls. Increase you swing speed in small increments while relying on your muscle memory to execute the smooth, rhythmic golf swing you have been practicing using wiffle golf balls. Make contact with the ball even in the slow motion mode. Then finish your practice session at your normal swing speed. If any one at the driving range asks ... you can tell them you are doing slow motion golf swing training like Ben Hogan did for most of his career. It helped Ben become one of the all time most consistent full swing ball strikers ever to play the game. As you become more confident in the slow motion drill at the driving range your normal speed full swing should produce some attention getting results. You may even feel like sharing your golf wiffle ball drill with anyone who asks. You are on your way to developing the perfect golf swing. This is going to increase the enjoyment you get out of your golf game. Longer, straighter golf shots are headed your way because you are increasing the frequency of sweet spot contact ... your are grooving your golf swing. Here’s one final request. If you know a golfer who hasn’t yet achieved your level of full swing consistency, take a few moments to share what has worked for you. You’ll have a friend forever. It’s often said that the best way to learn something is the teach it.